One of the most fevered recreational crazes during the final years of the last century and the first quarter of the present century was automobiling. Like elsewhere, the automobile craze in Middleborough and Lakeville infected many residents, though initially, not everyone was enthused with the new pastime. Recreational automobiling in the 1890s quickly indicated the lack of laws regulating it. The "new-fangled" contraption was notorious for raising dust, "spooking" horses - and worse. In 1894, the Bridgewater Independent was reporting wild times (and aggrieved residents) at Titicut: "Automobile drivers have been making a nuisance of themselves by riding on the sidewalks at North Middleboro, and as the town could not prevent it under existing laws, a new ordinance was adopted last week with a penalty of $20 attached, for its infraction." The numerous accidents and consequent restrictions placed upon automobiling did not deter its earliest enthusiasts who included among them Fletcher L. Barrows of Middleborough. Barrows, son of Middleborough shoe manufacturer Horatio Barrows, was an avid sportsman at the turn of the last century, well known for his love of hunting, fast horses, sleek boats and outdoors activity. Considering his interests and wealth, it is perhaps not surprising then that Barrows owned the first automobile in Middleborough, an expensive luxury at the time. Acquired in April, 1900, the vehicle was a steam-powered machine purchased at Boston. While the make of this first Middleborough automobile is not known, a number of automobile makers based in New England (then a center of the growing automotive industry) were producing steam-powered vehicles when Barrows made his purchase, including Stanley Motor Carriage Company (Newton, MA; "Stanley" Steamer), the Overland Wheel Company (Chicopee Falls, MA; "Victor" Steam Car), Waltham Automobile Company (Waltham, MA; "Waltham" Steam car); Grout Brothers (Orange, MA); and Edward S. Clark Steam Automobiles (Dorchester, MA). The arrival of Barrows' automobile on the evening of April 4 caused an immediate stir as residents clamored for their first view of a "horseless carriage." Upon his arrival in town, Barrows reportedly "took a spin around the streets, [and] as this is the first one ever owned in town everybody was eager to get a look at it. Consequently, it became a common sight to see a man running up a side street to get a glimpse of the first horseless carriage in town. Its appearance is also a novelty to the horses, who shy at it as though it was an 'infernal machine.'" Not long afterwards this event, the first automobile accident in Middleborough was recorded, involving Barrows' machine and a stone wall on East Main Street. "While allowing one of his friends to operate his automobile last week, Fletcher Barrows and a companion narrowly escaped serious injury. His friend, a novice in the business, lost control of the machine just below the Star Mills, and before Mr. Barrows could get the machine under control, it reared and made a sudden start for a nearby stone wall with disastrous results to the auto. It has been shipped to a repair shop." Barrows' automobile was probably similar in make to this steam-powered vehicle. 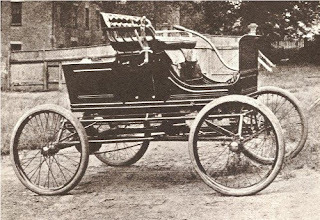 Although Barrows is generally accorded the honor of having owned Middleborough's first automobile, one source states that it was in fact Carlton W. Maxim who possessed the first automobile in town, acquiring a steam-power machine as early as 1896. 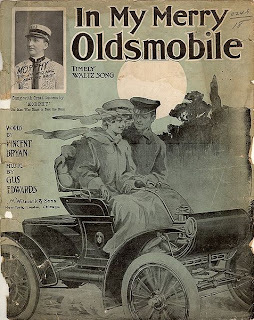 "In My Merry Oldsmobile", New York: M. Witmark & Sons, sheet music cover, early 20th century. Popular music in the early years of the 20th century underscored the romantic and adventurous aspect of the automobile. So fascinated was the public with the new innovation that few wanted to hear of its early unreliability as a means of transportation, its expense which put it out of the reach of most, or the accidents which occurred with inexperienced drivers - like Barrows' friend - at the helm. Brockton Enterprise, "Automobile in Town", April 5, 1900. Brockton Enterprise, "The Automobile 'Bucks'", undated clipping from April, 1900, James Creedon papers, Middleborough Public Library. Old Colony Memorial, "News Notes", April 14, 1900, page 3. I remember my Grandmother Dorothy (westgate) Briggs telling me she remembered the first car in Middleboro.